The surprising answer is from the chemistry of a single tail feather. Incredibly, specific compounds in penguin feather proteins allow scientists to track the birds’ migration over many hundreds of kilometres. The plumage records a kind of "chemical passport" stamped with a signature of the locations visited. Dr Michael Polito, of Louisiana State University, US, told BBC News: "You can say: 'penguins are where they eat,' because a geochemical signature of their wintering area is imprinted into their feathers." Two species of penguin - Chinstraps and Adélies - are the focus of the study published this week in Biological Letters. These animals both live on islands surrounding Antarctica, and migrate extensively in winter to reach rich-feeding grounds. Polito's team attached geo-locator devices to 52 adults at their breeding colonies on the South Shetland Islands, which lie 120km off coast of Antarctica. The scientists returned a year later to retrieve the tags in order to determine where the birds had been travelling. The use of such devices to trace the movements of long-ranging animals has revolutionised biology – both on land and in the oceans. But, this technique, so often seen on TV documentaries, has its drawbacks. It can be expensive, as well as causing some discomfort during attachment and removal. But in this new study the scientists also employed a new, cheaper, less invasive method to track the birds - one they believe can be just as reliable. Polito and his colleagues removed a piece of tail feather for laboratory study from each penguin that had a tracker on it. They then compared data on location from the tag and from the chemistry of the feather. And they matched. The chemistry locked in the feather records where the penguins migrated just as faithfully as the electronic trackers. The team uses a technique called compound specific isotope analysis to tell not only what the penguins have eaten but where they ate it. This works because the krill upon which the penguins feed incorporate into their own tissues a chemical signature of the ocean chemistry where they live. 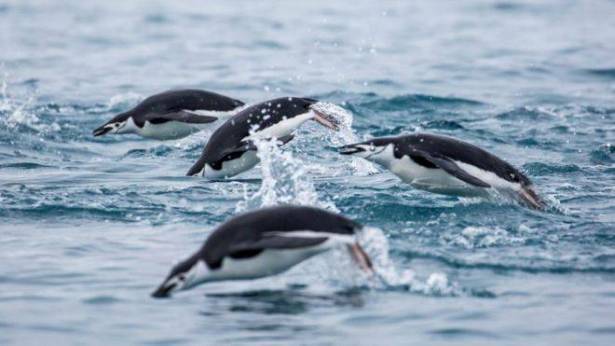 When the penguins then eat the krill, they in turn incorporate the krill chemistry, including the signature of where the krill live. In the case of penguins, the tail feather is selected for analysis because it is lost after breeding and grows back again during migration, and so its chemistry reflects that particular episode in the penguin's life. But this new technique can be used on other animals, explained co-author Dr Tom Hart, from University of Oxford, UK: “We can use this type of analysis on most animals, and in fact on tissues other than feathers, such as skin or muscle." Understanding where and when highly migratory species travel provides new information on aspects of their behaviour and feeding grounds. It can even give clues to their remarkable navigation abilities. Perhaps, most importantly, it can help in the conservation of several animal species under threat. "The great thing about this new technique is that we can work out where an animal has been based on a sample of an animal’s tissues without it ever being tagged," said Dr Hart. "We are going to continue to use this non-invasive technique on penguins, and it has great potential to be applied to other seabirds and marine mammals, such as whales and seals for example."